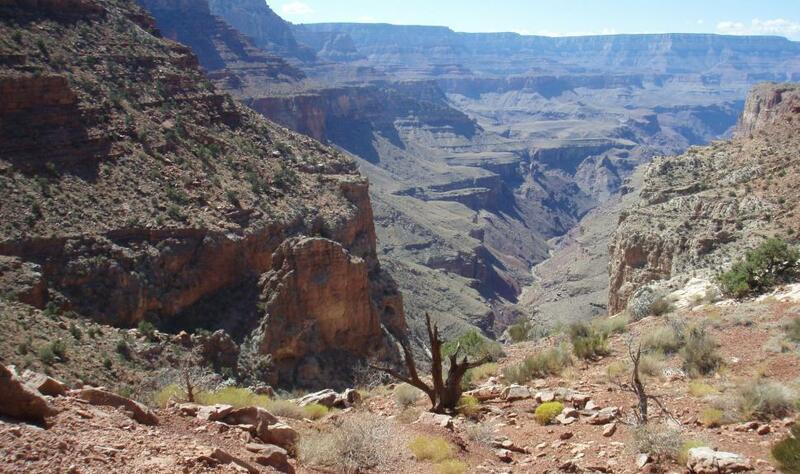 The Bright Angel Trail is the most popular and busiest trail in Grand Canyon National Park. 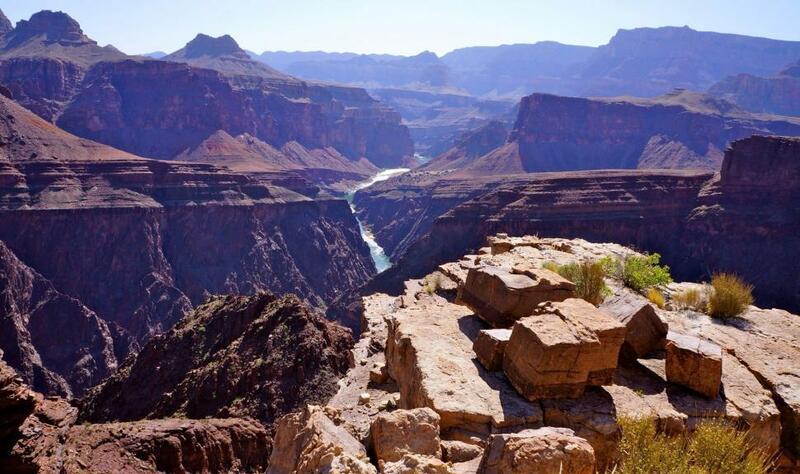 A Grand Canyon day hike on Bright Angel trail can vary from 3 to 12 miles, turning around anywhere from the One and a Half Mile House after 1.5 miles or hike 12 miles round trip to the picturesque Plateau Point with a fantastic view over looking the Colorado River. There is plenty to see as you hike down (and up) Bright Angel Trail – from 900 year old Native American pictographs to views galore. 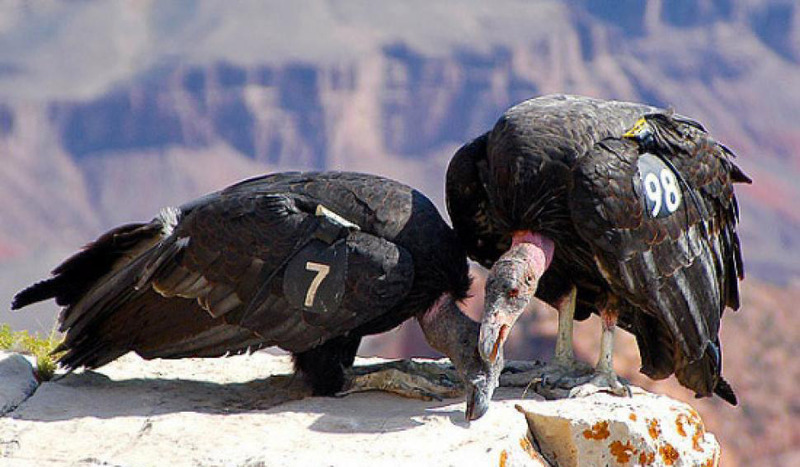 You might even spot California Condor or Big Horn sheep only a few yards below the rim. And because there are rest houses with water and shade along the trail, this is a great option for the warmer summer months. Winter hiking this trail is great as well. Throw on some ice cleats and you get to see the canyon layers adorned in the white stuff. This is also one of the two trails from the South Rim that will get you to Bright Angel Camp and Phantom Ranch. The South Kaibab Trail is a popular day hike in Grand Canyon, offering stunning vantage points most anywhere you stop to look. Hike .9 miles and descend 600 ft to Ooh Aah Point. (Kaibab is pronounced KY-bab where KY rhymes with Eye and bab rhymes with cab – for those of you who like to learn new words). Then continue another .6 miles and 500 ft descent to Cedar Ridge. For those ready for more of a challenge, continue your descent to Skeleton Point – 3 miles from the rim and a descent of 2000 ft below the rim. Those who make it to this destination will see the Colorado River and Bright Angel Camp still 3000 ft below. 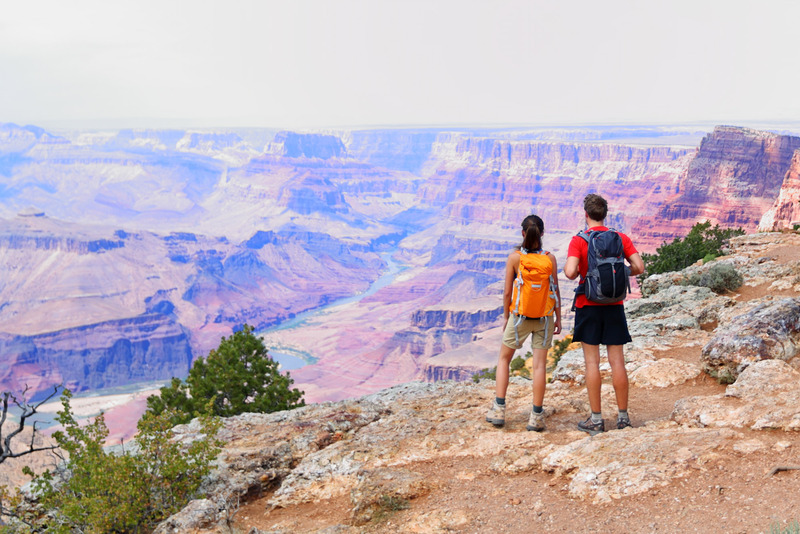 These three destinations along the trail make this a great trail for all levels of hikers looking to get a feel for what hiking the canyon is all about – beauty, splendor and heavy breathing! South Kaibab is the second of the two trails from the South Rim that will get you to Bright Angel Camp and Phantom Ranch. The Hermit Trail is easily accessible from Grand Canyon Village on the South Rim but feels like it is miles from the tourist centers of the canyon. 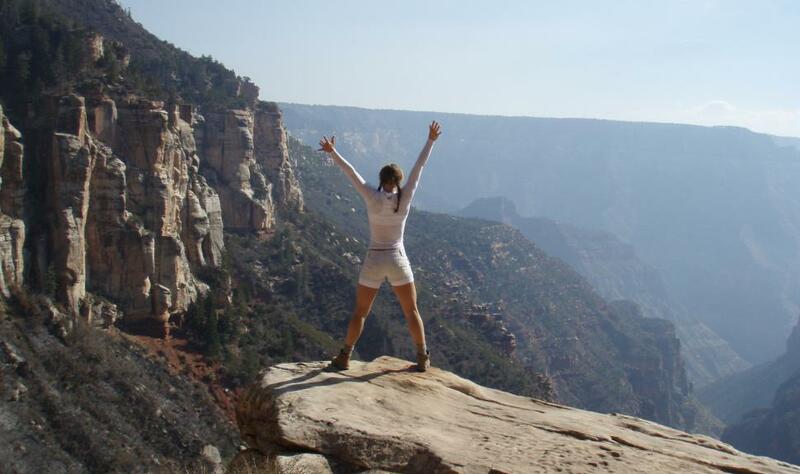 Compared to the hundreds of people that descend the Bright Angel trail on a daily basis, a Grand Canyon day hike down the Hermit trail will have you hiking with only a few canyon hikers, a great way to get away from the crowds without extra travel. Views, well-maintained trails, and over-all canyon awesomeness will greet you around every switch-back! Choose from a hike to Santa Maria Springs (a 5 mile round-trip hike into the canyon with a drop of 1,760 feet) or Dripping Springs (6.5 miles round trip with a descent from the rim of a mere 960 ft of narrow trail in some areas). Horseshoe Mesa from the Grandview Trail is a Grand Canyon day hike that takes the steep and strenuous Grandview Trail, 3 miles with a descent of 2,600 vertical feet to a mesa chock full of artifacts from the historic Last Chance Copper Mine. We can explore the only cave in the canyon that is open to visitors. 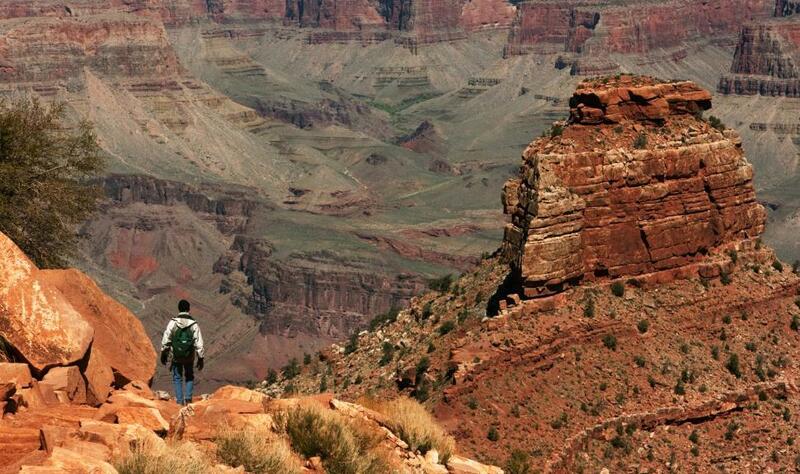 This trip is great for Grand Canyon hikers who are looking for a less crowded and challenging trail. We will explore the cave, go to the end of the west arm of the mesa for views down to the Colorado River over 2,000ft below. Expect the day to be 6-8 hours from start to finish – the mileage doesn’t seem like much but with exploring and the steepness of the trail, the day is long. Grand Canyon’s North Rim is a nice change from the more populated and popular South Rim. While it is only accessible from May 15th to about December 1st of each year, and much more of a challenge to get to, if you have the time, drive over and take a hike down the North Kaibab Trail to Supai Tunnel (1.8 miles with a 1,600 ft change in elevation), or take it a bit further to the Red Wall Bridge (2.5-ish miles). Because the North rim is about 1,000ft higher in elevation, expect to see more leaves changing in the Fall and clusters of Aspen trees that are a rare find on the South Rim. Oh, and when you are driving to the North Rim entrance, you will likely see a herd of Bison (or at least our version of them)! They are actually called beefalo as they were bread as a Bison/Cow hybrid about the early 1900s.